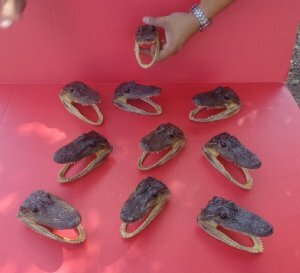 We have hand selected and photographed these 10 piece lots of alligator heads in sizes ranging from 5 inches to 6 inches and they are from an approximate 3 foot gator. All of these alligator heads for sale are from alligator farms and licensed hunts. These gator heads may have missing/broken teeth, scars, scrapes, cuts, etc. These are real alligators and will have imperfections due to fighting! These gator heads do not have felt backing - the open backs of the heads have been painted BLACK. There will be an odor from the clear sealant used on these heads. The odor will subside over time.